I’m thankful that Gayle Forman (immensely talented!) 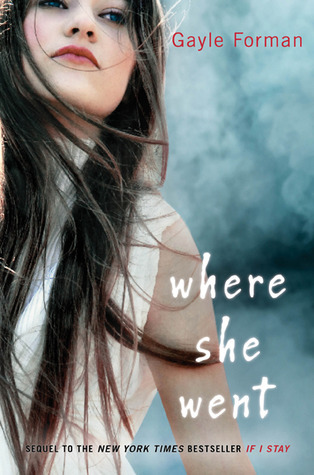 wrote If I Stay and this follow-up, Where She Went, out April 5th. I’m thankful that Kiersten White decided to give an ARC away on her blog. I’m thankful that luck was on my side (for once!) because I WON the ARC! Most of all, I’m thankful that this sequel lived up to (far surpassed, really) all of my expectations. The writing is gorgeous, the plot is compelling, honest and painful, and the story had my heart pounding and my nerves on edge constantly. At the risk of spoiling anything, I’ll just say this: I LOVED Where She Went, and I think Gayle Forman is a genius. You know what else I’m thankful for? The opportunity to pass my ARC of Where She Went on to another reader. 2. For an extra entry, tweet about this contest, including a link to this post. Leave me a second comment letting me know about your tweet. 3. This contest is open internationally, now through Sunday, March 27 at 11:59pm PST. I will tally all of the entries and draw one winner randomly. 4. Check in on Monday to find out if you’ve won. Favorite contemporary YA? Man this is hard to pick just one. SPEAK still holds a very dear place in my heart, even after all these years. John Green is also a genius though, and LOOKING FOR ALASKA is another of my favorites. I can’t wait to read this! I have so many contemporary YA books that I love, but at the top of that list is Jellicoe Road. Such a beautiful story. Jellicoe Road is just..wow. But to pick something different I’ll say Sweethearts by Sara Zarr. Plus, the cover looks delicious. ok I have to say Gayle Forman, I read “if I Stay” and loveted. let me wan it more and here it is, Thnks for the give away. Honestly, my favorite YA novel is If I Stay. But right now I’m reading Matched by Ally Condie, and I love it! Thanks for the giveaway! I posted about my favorite yesterday…This Lullaby by Sarah Dessen. Another favorite is The Sky Is Everywhere by Jandy Nelson, who is a friend of Gayle Forman. If you haven’t read that one yet, you NEED to. Such poetic and beautiful writing. Oh, and people who don’t win Katy’s copy…they just put Where She Went up on NetGalley! Oh my gosh… You guys have excellent taste! I’ve read every one of your favorites so far, and I love them all! THE SKY IS EVERYWHERE and JELLICOE ROAD are my two all-time favorites. oh, a lot of great ones have been mentioned already. I really enjoyed Stolen by Lucy Christopher. I thought it was beautifully written and also fascinating! I am tweet-phobic still. I’m totally going to start tweeting in 2012. I swear. Wow, how to pick! The Sky Is Everywhere… for sure!!! I’m pretty sure you’re the person who recommended If I Stay to me in the first place… I read it having no idea there was a sequel coming. I nearly died when I found out about the wait! It’s such an incredible book. I think at the moment my favourite YA contemporary book is Will Grayson, Will Grayson, by John Green and David Levithan. It has the most incredible and authentic teen voice, and the story transported me. Couldn’t put it down. My favorite contemporary YA novel is The Truth About Forever by Sarah Dessen. It was the book the made me fall in love with YA and reading in general. And it’s just a beautiful book.